The Securities and Exchange Commission is determined to catch accounting manipulators, says Mary Jo White. But will it have the money and means to do so? That focus has sharpened considerably in the wake of the financial crisis and Bernard Madoff’s massive Ponzi scheme. Former chair Mary Schapiro brought record numbers of enforcement actions in her tenure. And White, in her short time, has tried to boost the image of an SEC that is the country’s toughest cop on the financial markets beat. She’s adopted a “broken windows” philosophy of deterrence that emphasizes no offense is too small to ignore. In addition, she has repeatedly stated that the SEC is determined to step up its pursuit of corporate wrongdoers. The success of those efforts, however, is very much to be determined. Much will depend on whether the agency can gain the resources it wants from an ever-parsimonious Congress. At this point, though, the SEC is playing catch-up with earnings manipulators. A 2012 Duke University/CFO magazine survey, for example, found that a majority of CFOs believe that earnings management and shady accounting techniques go largely undetected, for significant periods of time. The crackdown on accounting fraud actually comes when the number of such cases has been steadily falling, along with the number of restatements. In fiscal 2013 the SEC brought 68 enforcement actions concerning financial fraud or issuer disclosure, the sixth straight year of decline and the lowest number in years. There is no clear evidence of what’s causing the drop. But even the SEC’s director of enforcement, Andrew Ceresney, doesn’t believe the falloff is due to Sarbanes-Oxley and better internal controls at corporations, an observation some have made. Instead, Ceresney has implied that much fraud is still flying under the agency’s radar screen. If the SEC can’t catch more companies in its net, it may be able to wring some public confessions out of the wrongdoers it does catch. That’s because the SEC is adopting a new admission-of-misconduct policy. The agency’s longstanding “neither-admit-nor-deny” policy, whereby companies settle charges without admitting or denying wrongdoing, has been criticized for being insufficiently deterrent. Under the new policy, the SEC will insist on an admission of misconduct in cases involving “particularly egregious conduct or widespread harm to investors,” as White said in an October 2013 speech at Fordham University. Elsewhere she explained that the agency would also require a company to admit wrongdoing in cases in which the conduct posed a significant risk to the market or investors; the admission would aid investors deciding whether to deal with a particular party in the future; or reciting unambiguous facts would send an important message to the market about a particular case. But how often will the SEC be able to force a fraudster to admit he or she caused harm? After all, it may take much more resources to build an ironclad case that forces the perpetrators to admit defeat. And the SEC will still use its neither-admit-nor-deny policy, an important tool in the enforcement arsenal because, the agency says, it allows for higher settlements and faster relief for victims. 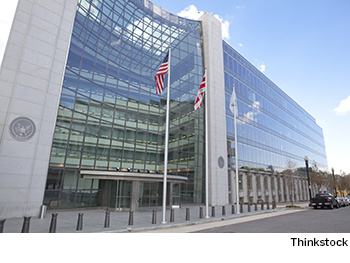 Will the SEC receive the additional resources it says it needs to crack down on accounting fraud and tighten up cases against all kinds of financial tricksters? White is asking Congress for $1.7 billion in funding for fiscal year 2015, up from $1.35 billion last year. 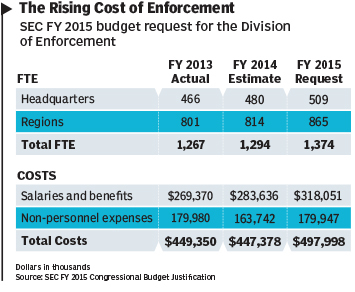 Of that request, nearly $500 million would be earmarked for the Division of Enforcement. In its Congressional Budget Justification for fiscal year 2015, the SEC notes the challenges facing the Enforcement Division. For example, the agency’s whistle-blower program has produced more than 6,500 tips through fiscal 2013, resulting in several large rewards. But the thousands of tips streaming in require people to vet them and investigate promising leads. Meanwhile, the aforementioned admission policy will result in additional litigation when defendants refuse to acknowledge wrongdoing. Overall, the agency says it needs more attorneys, forensic accountants, IT professionals, staff members, and technology to be the tough cop on the beat White wants it to be. Marielle Segarra is a reporter at public radio station WHYY in Philadelphia. Edward Teach is editor-in-chief of CFO.